Kuwait is certainly not known for its tourism draws. In fact, I wouldn’t be surprised to learn that their official tourism board is staffed by one lonely guy burning up his iPhone's battery flinging angry birds around, merely glancing up once a month to hand out a flight schedule to Dubai to a wayward visitor. Despite this assumption, I was bound and determined to find something worth seeing in Kuwait. When we lived in Cairo and had visitors, I spent hours trying to figure out how much we could cram in considering daylight, traffic, jet lag, and nourishment requirements. Conversely, in Kuwait we’ve had just one visitor and to be honest, my mother came to see her granddaughter, not Kuwait. 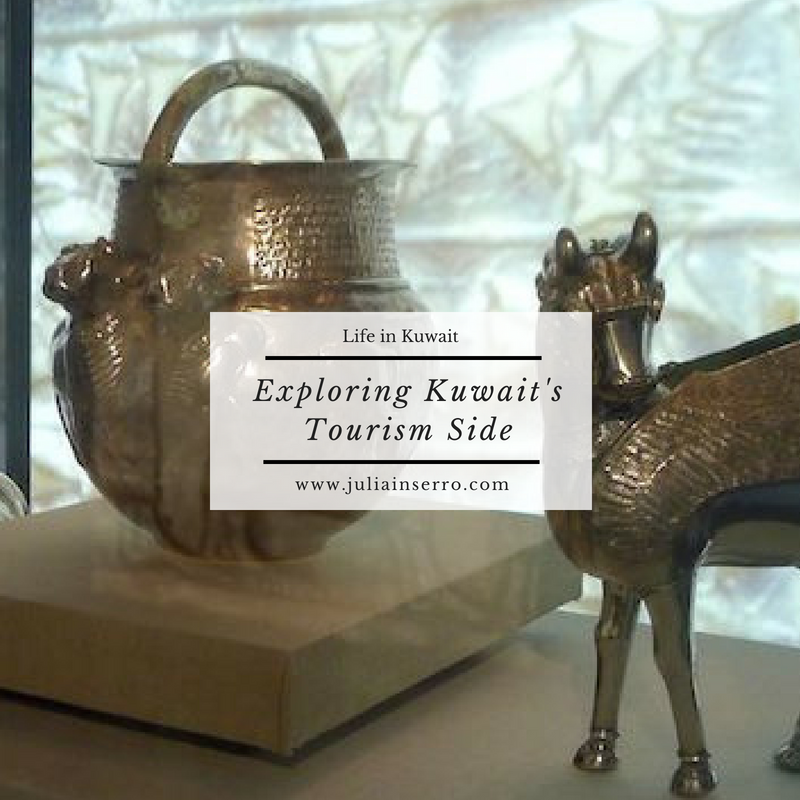 But, with our departure from Kuwait looming, and never one to turn down an opportunity to drag someone around with me, I gathered up the “Kuwait Bucket List” that I had amassed from various blogs and lured Mom into the car and off we went! In hindsight, and in full honesty for any others who are seeking “things to do in Kuwait”, I think we were about 50/50 for finding gems versus germs. The biggest “germ” was the alleged Ahmadi Japanese Garden located on the Kuwait Oil Company (KOC) compound. I had found several references to it on blogs, even as recent as a few months ago, saying how beautiful it was, and how stunning the flowers were and what a little oasis it was. So, always in need of a little oasis stop, I figured it should be at the top of our list. It’s located just off Ring Road 30 on the expansive KOC compound. We drove around the compound loop once and I pulled in to a very empty parking lot where I thought it should be. We pulled up to a large sign and read out loud, “Bioremediated Soil Park.” After we caught our breath and wiped our laughter-induced tears away, Mom got out to climb over the rubble to just confirm that there was nothing worth seeing. Once confirmed, we turned around and headed home. When I told my husband that evening, he said, “You took my daughter to a land fill?” “Well, it was supposed to have pretty flowers,” I said. “Welcome to Kuwait,” he said. Our next germ, and you may notice a trend here for my desperate need for anything nature-related, was to seek out the flamingos. My carpet weaving teacher, Hussain, had casually mentioned that there were hundreds of flamingos on the Gulf up by the hospital complexes. As soon as I heard this I pummeled him for exact directions and times. So one morning, Mom and I grabbed Bean and headed out in search of flamingos. I was so excited; real wildlife!! 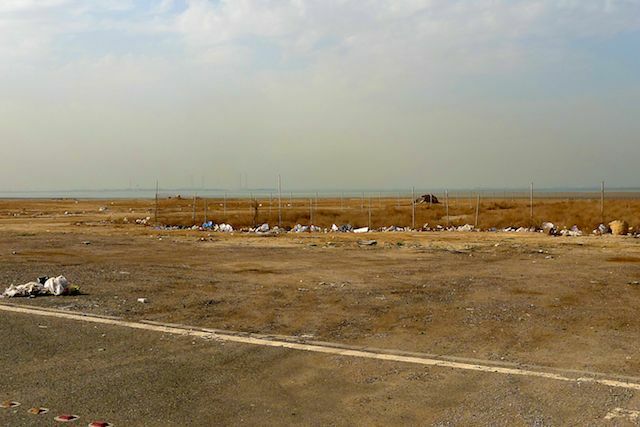 We drove out on the Gulf Road, merged on to the Coastal Road past the port, and then came to the sea of endless construction. We wound our way through the ever-changing traffic patterns and looked for the entrance to the maternity hospital. Hussain said it was best to head there and park close to the water. I did have a few failures that weren’t quite germ-worthy, in that I took Mom to see the Heritage Souk and Fabric Souk in the middle of the day and everything was shut. I made an appointment for us to see the Mirror House, then couldn’t find it and missed our appointment. The Grand Mosque and Kuwait Towers both appeared to be under construction and currently not open to visitors. And the building that I though was the Dhow Museum, was actually the Dhow Builders Union headquarters, but we at least got to see some boats. However, not all of our outings resulted in unmitigated failure. For all our “germs” we actually did find some genuine highly-surprising “gems.” Two of which were the Tareq Ragab museums. There’s the Museum of Islamic Calligraphy, located in Jabriya just across from The New English School, and the Islamic Museum, located a few streets away. Both cost 2kd per person, but are worth it. And in a highly atypical manner, their website (www.trmkt.com) is actually helpful and informative, offering radical things like a map and hours of operation. The Tareq Ragab Islamic Museum was brimming with items from all over the world. Their collection of musical instruments was like nothing I’d ever seen before. They had thousands and thousands of items of jewelry on display, as well as clothing and ceramics and firearms and thousand-year-old documents. You can also learn how they amazingly managed to hide their collection of over 20,000 pieces from Saddam’s troops during the invasion. If you don’t have a wiggly one-year-old to deal with, you could easily spend hours here and it would be well worth it. In addition, the Museum of Islamic Calligraphy was equally impressive. My one complaint is that there are fewer labels here, so you don’t know what you’re looking at. The displays are attractive and the calligraphy is beautiful, but it would be nice to have more information. For the items that are labeled, it’s informative and typically interesting. For example, seeing the Qur'an written on palm fronds sewn together into a huge book that’s over 500 years old is pretty impressive. When we were there, there were only one or two other visitors, however there was also a crew filming in a back corner. Typically this wouldn’t have been an issue, however Bean discovered that the two-story open-style architecture provided excellent acoustics for her to practice her high-pitched dolphin calls. So I kept plying her with rice crackers and spent a lot of time trying to find less-echoey corners for us to explore. One thing to note that is important for other potential explorers, is that most museums in Kuwait tend to be closed from noon to 4pm every day, which does not mesh well with napping babies, and is annoying on several levels, but we had no choice and adapted accordingly. 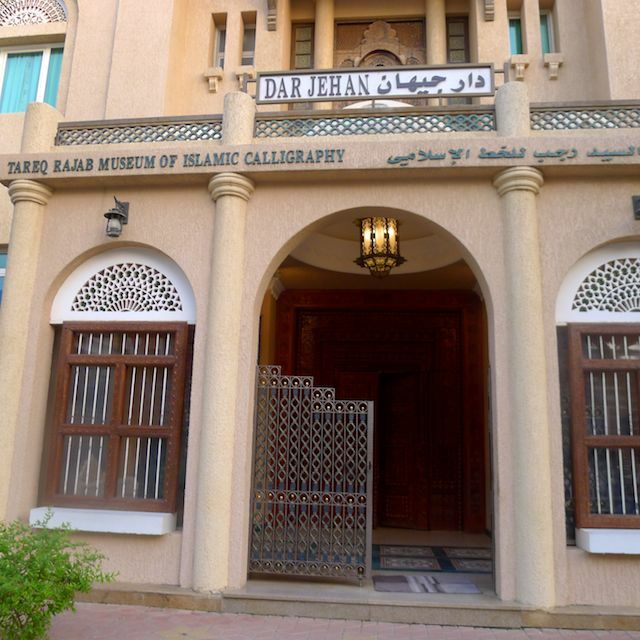 The one museum that is not closed for lunch and is actually open from 10am-7pm (Mon-Thurs and Sat, and closed Sun), is the Dar al-Athar al-Islamiyyah, which is also worth visiting, plus it’s free. It’s located on Gulf Road, up past the General Assembly building. It’s near the intersection of Gulf and Abdul Aziz Hamad Al Sager Street, and is allegedly in the old hospital building. When we visited, they had a wonderful exhibit on “Splendors of the Ancient East” with beautiful displays, clear labels (which was such a delight after the post-it labels we found in the Cairo museum) and artifacts we had never seen anywhere else. They also have a nice gift shop, which is rare here. There are a few more museums that are still on my bucket list that I will just have to drag my husband to. But overall, I’m pleased with the gems we discovered. There was one more museum that we visited that deserves its own write-up. So, stay tuned for the museum featuring Saddam Hussain’s head.